The summer is a season of harvest and preserving. It feels especially rewarding when I get to open a little jar of summer in the cold winter months. Nothing beats the flavour and taste of homemade jams. 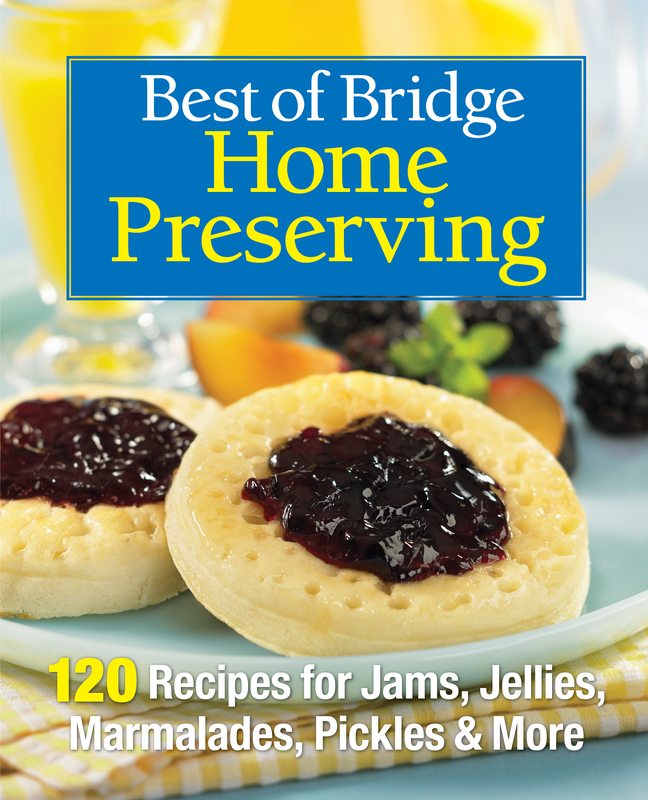 I was very excited when I received a review copy of Best of Bridge Home Preserving:120 Recipes for Canning Fruits & Vegetables because I love making fruit jams at home using seasonal and local ingredients, for just enjoying at home and for gift giving. I usually make single-fruit jams, this was my first time trying a mixed-fruit jam, and this recipe is a winner. I made raspberry jam last year, and really loved the flavour of it. This one combines the little tartness and fruitiness in the plums and the bold flavour of raspberries. It is also great because it only has half of the seeds of a regular raspberry jam. Making jams is really not difficult and the equipment is inexpensive and can be easily found in supermarkets. The book is very user-friendly, especially if you are new to preserving it will have all the information to get you started. As for me, I’ve only made fruit jams, I might venture into the chutney, pickle, and marmalade recipes in this book. If you’ve never made jams before and would like to try this recipe, you can do some research online and you should be able to make this without too much difficulty. Yield: Makes about six 8-ounce (250 mL) jars. 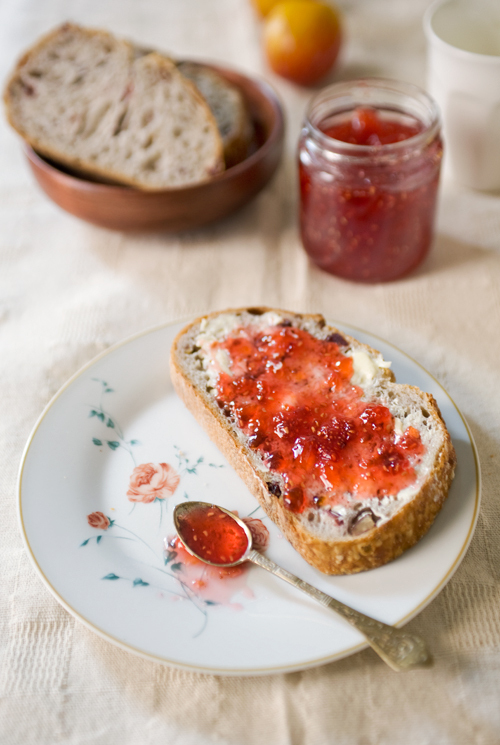 Plums add delicious yumminess to this jam, which has half the seeds of regular raspberry jam. It can also be made with red or black plums, or with plumcots (a cross of plums and apricots). In a large, deep, heavy-bottomed pot, combine raspberries, plums and lemon juice. Bring to a boil over high heat, stirring constantly. Add sugar in a steady stream, stirring constantly. Bring to a full boil, stirring constantly to dissolve sugar. Immediately stir in pectin; return to a full boil. Boil hard for 1 minute, stirring constantly. Remove from heat and skim off any foam. Stir for 5 to 8 minutes to prevent floating fruit. Ladle into sterilized jars to within 1?4 inch (0.5 cm) of rim; wipe rims. Apply prepared lids and rings; tighten rings just until fingertip-tight. Process jars in a boiling water canner for 10 minutes. Transfer jars to a towel-lined surface and let rest at room temperature until set. Check seals; refrigerate any unsealed jars for up to 3 weeks. NOTE: Actually…I changed the recipe a little…I added the zest of half a lemon for the refreshing taste and half of a vanilla bean. I just love the vanilla flavour in this jam, it adds a sweet and dessert-like character to it. I also like my jams with a chunky texture, so I usually don’t chop or crush the fruit too much, but it is totally up to you! My favourite way to have any kind of jam is slathering it on a buttered piece of fresh bread or toast (*drooling a little*). Though the recipe says it will yield six 250 mL jars, I was able to get five, it depends on the fruit itself such as the moisture, pectin, and the pot you use etc. but to me, all it matters is the delicious jam! never made my own jam before, definitely inspired to now. love the look of this raspberry and plum flavour! Give jam making a try, they it is so easy and you can control the quality of the fruit!